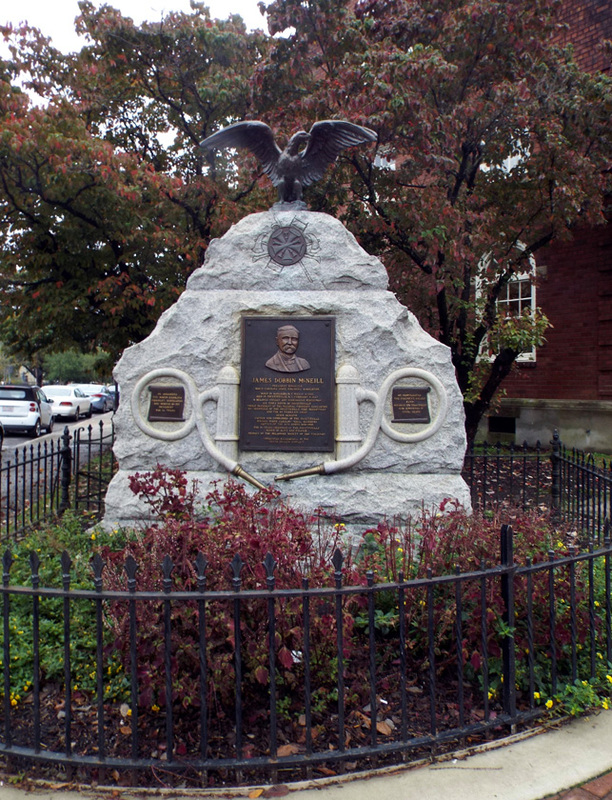 The James Dobbin McNeill marker is a large block of rough, unfinished granite with a high serpentine shaped top. Mounted on the serpentine’s peak is a small bronze spread winged eagle sculpture. On the front directly beneath the eagle is a bronze medallion with five crossed bugles in relief. Carved into the stone around the medallion are depictions of two fire axes, a pike and ladder. 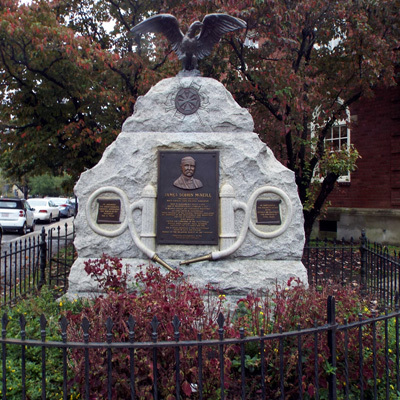 The largest of three bronze plaques is attached to the center of the granite block. It contains a bas-relief depiction of McNeill above the inscription. Bracketing this plaque are two fire hydrants with curved hoses carved from the stone in relief. The hose of each forms a circle in which the two smaller plaques appear. Inset into the stone at the end of each hose is a bronze fire hose nozzle. The marker is surrounded by a low wrought iron fence. Center plaque: JAMES DOBBIN MCNEILL / PRESIDENT EMERITUS /NORTH CAROLINA STATE FIREMEN'S ASSOCIATION / BORN IN ASHEBORO, N.C. MARCH 4, 1850 / DIED IN FAYETTEVILLE, N.C. / FEBRUARY 9, 1927 / A BELOVED CITIZEN AND COURAGEOUS STATESMAN / SIX TIMES MAYOR OF FAYETTEVILLE / THRICE PRESIDENT OF THE NATIONAL FIREMEN'S ASSOCIATION / RE-ORGANIZER OF THE FAYETTEVILLE FIRE DEPARTMENT / AND FOR 40 YEARS ITS CHIEF. / STATE SENATOR / CAPTAIN AND COMMANDER OF THE FAYTTEVILLE / DIVISION NORTH CAROLINA NAVAL RESERVES / CAPTAIN OF THE RED SHIRTS 1891-1920. / FOR 10 YEARS CHAIRMAN OF THE FAYETTEVILLE / BOARD OF AUDIT AND FINANCE / MEMBER OF THE DELAWARE SOCIETY OF THE CINCINNATI / UNDAUNTED, RESOURCEFUL IN THE / NEVER CEASING CONFLICT. 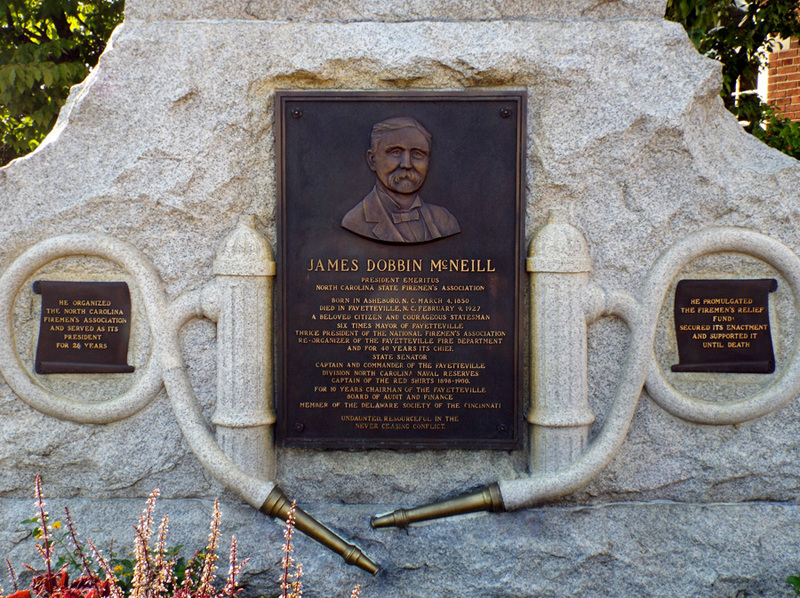 Known as the “patron saint of North Carolina firemen” McNeill was an important figure in the history of professional fire fighting in the state. In 1934 the Firemen’s Association presented a portrait of McNeill to the State Hall of History. He was also a Captain in the Red Shirts which were organized groups of armed, mounted white men acting as a terror and intimidation wing of the Democratic Party. The Red Shirts received their name from loose red tunics worn as uniforms. They had the greatest impact on the elections of 1898 and 1900, by preventing non-Democrats from voting. These elections saw the Democratic Party regain control of state politics from the Republicans and also pass the first laws limiting the rights of blacks to vote. The marker is at the corner of Green Street and Bow Street, in front of a building that once housed Fayetteville City Hall and currently is occupied by the Fascinate-U Children’s Museum. The museum street address is 116 Green Street, Fayetteville, NC. Shady mature trees are planted by the memorial.